Greg, in Austin, Texas, wants a Royal Enfield C5 motorcycle so badly that, to raise the money, he is selling an interesting little motorcycle. 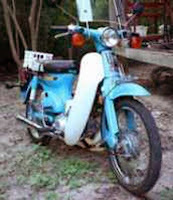 It's his 1981 Honda C70 Passport, a 70cc step-through motorcycle that some say was the world's best motorcycle design. And they may be right, if you consider the variety of conditions that apply around the globe. I have a soft spot in my heart for the little Honda because it was the first motorcycle I rode on, as a passenger. It belonged to a friend at school. He brought it over to show it to me the night he got it, and gave me a brief tour of the Los Angeles suburb where we lived. My personal transportation at the time was a Schwinn bicycle, so the motorcycle ride prompted an exhilarating rush of thoughts about where you could go and the things you could do with mobility like this. Moreover, the Honda was so incredibly sophisticated, I thought. It had a speedometer, odometer, high beam warning light, comfortable suspension, turn signals and rear-view mirrors. As far as I was concerned, nothing you needed was missing except a roof and, you know, it never rains in Southern California. I never saw that Honda again. I suspect his parents decided it wasn't safe, after all, and got him a car. It would be a long time before I could afford to park my Schwinn. But I've never forgotten the excitement I felt that night on the C70. I suspect I share that with a big part of the world's population. Greg will like the Royal Enfield C5. It's a terrific motorcycle. But, at only $1,000, somebody is getting a great deal on that Honda. I also love that Honda. In college, I rode a friend's C90 Passport and had a blast. It turned me on to the world of motorcycling, though it would take decades more before I actually bought my first bike. whoah I just did a serious double-take! what a surprise that in my internet obsessing I would bump into a story involving myself! I've got to admit it made me a little sad to sell the Honda - they are really wonderful little bikes that are all about fun. I liked your personal story of Passport-inspiration. Have you seen the Symba? (brand new version of the Passport/Supercub by Sym, who handled production for Honda for years) I have been waiting to secure employment before throwing down the cash for the Bullet. I just got a job so I should be the proud owner of a C5 any day now. For the time being its just me and my old 70's Raleigh bicycle. Way too much exercise!